Carter is a royal purple PixieDust. It's such a rich and deep purple that is perfectly gorgeous in 2 coats. 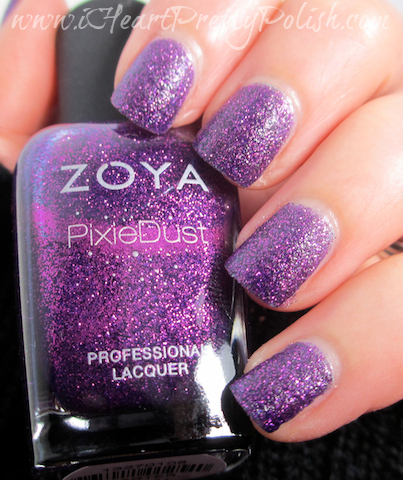 If you are familiar with Zoya PixieDusts, you know that you aren't suppose to wear a base or top coat. PixieDusts are suppose to be textured. I have heard a few people say that they aren't into the textured polishes, so I thought I'd show you what they look like with a top coat. As you can see, a top coat brings out more sparkle and shine. It's so multi-dimensional and looks like a beautiful purple galaxy! Stay tuned for the rest of the Fall PixieDust Collection. I will continue to show you these polishes with and without a top coat as I think it shows the versatility. Which PixieDust do you think will be your favorite? Do you wear them with or without a top coat? Note: Zoya Carter was provided to me for my honest review. See my Disclosure Policy for more information. Yes, it's so pretty! I loved wearing it. i love this color SO MUCH! I know. I love purple and this is no exception! This is such a beautiful purple! I agree - love it! I'm just a party pooper...I like Pixie Dust with topcoat. :) That's a recipe for a great polish! This is a gorgeous purple...but I am thinking Arabella will be my favorite. I love that you have a choice and wear this a few different ways:) Yes, Arabella looks pretty! You've captured precisely what I love about the textureds: there are so many options with these gorgeous polishes...something for everyone. Lovely colour! I love how it looks with the top coat! So glossy! Yes, the top coat really adds a lot of depth to the polish! You're so lucky to have the whole collection! I can't wait to get Carter. You make it look perfect, and have shown me that I obviously need all of the Pixie Dusts! Yes, I enjoy it either way. You should pick it up! Gorgeous, gorgeous purple! It's so amazingly, brilliantly sparkly :) Awesome photos, as always! I wasn't a huge fan of this collection at first, but I am really loving every color in it! They are all so gorgeous! I know. It's hard to tell from the press releases. 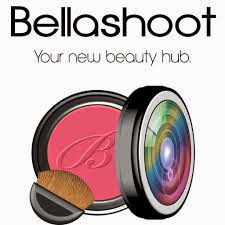 You really need to start seeing swatches to know what they look like. Love it! Its def a pretty nail color which makes it perfect for any occasion. What's also amazing with it is you can wear it without top coat and still looks so pretty. i think this is the one i am most excited about, too. it's so gorgeous! Yep, it really stands out in the collection.